James and Lisa Murata flew from their home in the USA to the picturesque island for the unique shoot following their Scottish wedding ceremony on September 25. For most brides, rain on their wedding day would be a disaster – especially for one who had travelled across the Atlantic to tie the knot. But for Lisa Murata and her husband James, the wild Skye weather was just a great photo opportunity. The brand-new Mr and Mrs Murata had flown from their home in Chicago to Skye for after considering locations around the globe. 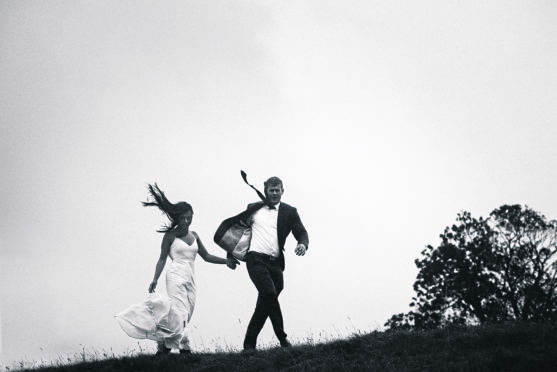 The photographs capture the bride traipsing through muddy bogs in her stunning white wedding dress and with her with her hair whipped up by gale force winds. The bridegroom’s neatly-tailored wedding suit is soaked through by sheets of rain lashing the crags. James, 33, and Lisa Murata, 31 flew from their home in the USA to the picturesque island for the unique shoot following. The couple, who have been together for four years, got in touch with photographer Andrew Rae and arranged their wedding for late September. “Boy, were we in for a surprise. The wind was unreal. The weather in Chicago fluctuates pretty regularly in spring and fall. We could have a week of 70F and have snow the next. Lisa said the couple took a while to decide on their perfect destination to elope but after spotting pictures of the island, their mind was made up. “We wanted to end up in the Fairy Pools, but due to the weather we never made it.